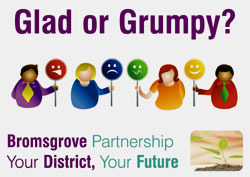 A postcard campaign by Bromsgrove District Council that asks local residents whether they are ‘Glad or Grumpy’ with the council’s service has caused a stir and despite costing over £1,500 is having to be reprinted and redistributed to people in the area. 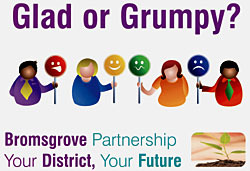 Disagreement arose as some Labour councillors took exception to the postcard’s illustration with different characters holding up placards with ‘glad’ or ‘grumpy’ faces on them. The two black characters had been allotted the ‘grumpy’ faces and consequently the postcards were branded racist. The Commission for Racial Equality disagreed and claimed that the illustration was neither offensive nor unlawful. Regardless of this response the postcards have been withdrawn and will be reprinted with a white grumpy person instead. The council are playing this down, claiming that the redesign and reprint is no extra effort as the campaign has been so successful that they have run out of the ‘offensive’ postcards anyway and would have needed some new ones printed up. This seems unlikely as the response from Bromsgrove District Council to a Freedom of Information request by the West Midlands TaxPayers’Alliance stated that 35,000 of these postcards had been produced, and a Bromsgrove Advertiser report from the beginning of this month claimed that the ‘overwhelming’ response to the campaign had yielded only 250 completed and returned. That they would need new postcards printed-up regardless of this controversy seems very unlikely. Frittering more money away on this campaign seems typical of a council who recently spent £40,000 headhunting for a £60,000-per-year council post. Unfortunately this kind of waste is prevalent in local government in the region, with silly schemes funded by councils who happily and carelessly dip into the public coffers, and then dip into them again when things go wrong. Sadly for Bromsgrove taxpayers, this council seems to be showing no signs of upgrading their sorry 1 out of 4 rating for value for money.